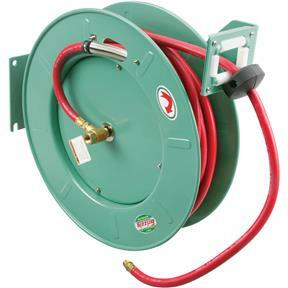 Our professional quality auto retractable hose reel features heavy duty frame, solid base and can be mounted horizontally or vertically. The arm can be adjusted to a variety of angles. Each unit includes heavy duty air hose and is engineered for daily use. 3/8" NPT. Maximum 250 PSI. 50 ft, 3/8" hose. I am really satisfied with my hose reel. It is very sturdy and was easy to put up. This is the second one I've gotten from Grizzly and am satisfied with their products. The other one lasted long time hope this one does too. Not disappointed at all.